I just finished first board of my dual TM3030 build. It sounds great but the VCA seems to be behaving strangely. Note is playing all the time and goes off when I press the key down on the midi keyboard. It starts playing again when I release the key or wait couple of seconds. It pretty much feels like the gate signal gets inverted at some point or the whole envelope is upside down. The gate led works as expected so the problem is not in the digital part. Any ideas where to start looking for a mistake? Or suitable places to check the signals with an oscilloscope? Got the second board also up and running and it behaves exactly the same so it's probably a component issue somewhere and not a random bad contact. At pin 2 of Q31 I can see a rising envelope when I play a note. It drops from about 5.8V to 0V when the note is played and then slowly rises back to about 5.8V. Is this normal? Are there any other places to check? I'm trying to figure out what part of the circuit to look for a wrong component. I still don't know if it's the envelope part or the VCA that is failing. It does sound like your whole envelope is being triggered when gate is low instead of when gate is high. So check again the transistors in the gate circuitry. It is unlikely that you've made the same mistake twice but not impossible so it's best to check. Check that Q23 are Q27 are both NPN, ie. BC550 or BC549. Check that Q22, Q28 and Q31 are all PNP, ie. BC560 or BC559. The transistors are correct. I also checked all resistors and capacitors from that block. PNP:s are BC560C and NPN:s are BC550C. Here's a picture of the envelope signal I'm seeing in pin 2 of Q31. It seems to trigger correctly when the gate goes high (when I press and hold the key down). Is the polarity of the envelope correct? 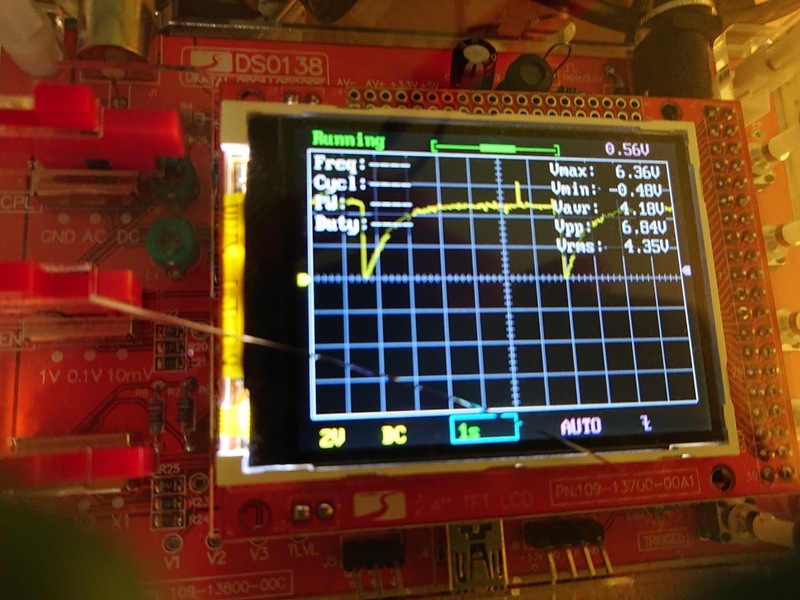 The voltage level shown in my toy oscilloscope is divided by 2 so it's actually about 10V, drops to 0V when envelope kicks in and rises back to about 10V. To me this seems to be about right but it's already way too many years from my university electronics courses so I'm not very sure about anything. I don't have enough skills to fully understand this envelope generator circuit. The pin 3 of Q31 seems to be about 0.9V when gate is off and slowly rises to 12V when key is held down. Would be nice to see the signal that goes to CA3080 but I think it's current that I should be looking at, not voltage. What you are getting on pin 2 does seem correct. What about pin 5 of the CA3080? It is a current drive but the voltage will change a bit with the current. It should move slightly more positive from 600mV when the envelope is applied. Also, pin 1 (collector) of Q22. That should be around +12V when the gate is high and 0V when the gate is low. Do you have any other CA3080 ICs you can try? There's a lot of fake CA3080 ICs around at the moment. I'll check Q22 voltages tomorrow. If I recall correctly pin5 of CA3080 acted like you describe. I'll visit the local electronics store and get another pair of CA3080's. I might have ordered the components from ebay so they might be bad. Can't remember anymore since it's already more than a year since I sourced the components for this slowly progressing project. Still need to fix the other board and calibrate everything and finish the enclosure. Can't wait to play some crazy acid music with the tm3030's!